Authors: L. Fu, M. Kilbinger, T. Erben, C. Heymans, et al. Higher-order, non-Gaussian aspects of the large-scale structure carry valuable information on structure formation and cosmology, which is complementary to second-order statistics. In this work we measure second- and third-order weak-lensing aperture-mass moments from CFHTLenS and combine those with CMB anisotropy probes. The third moment is measured with a significance of 2σ. The combined constraint on Σ8=σ8(Ωm/0.27)α is improved by 10%, in comparison to the second-order only, and the allowed ranges for Ωm and σ8 are substantially reduced. Including general triangles of the lensing bispectrum yields tighter constraints compared to probing mainly equilateral triangles. 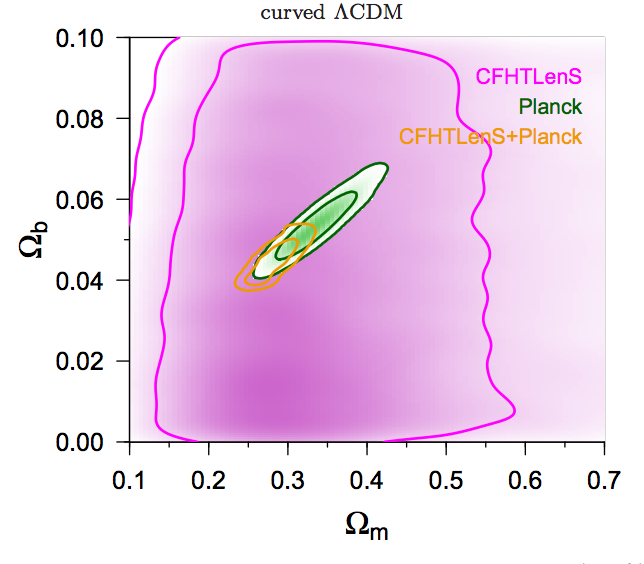 Second- and third-order CFHTLenS lensing measurements improve Planck CMB constraints on Ωm and σ8 by 26% for flat ΛCDM. For a model with free curvature, the joint CFHTLenS-Planck result is Ωm=0.28±0.02 (68% confidence), which is an improvement of 43% compared to Planck alone. We test how our results are potentially subject to three astrophysical sources of contamination: source-lens clustering, the intrinsic alignment of galaxy shapes, and baryonic effects. We explore future limitations of the cosmological use of third-order weak lensing, such as the nonlinear model and the Gaussianity of the likelihood function.